I know this article is a little late but life happens to get in the way sometimes but I really wanted to do a preview of my personal experience with Killzone Mercenary. At E3 I got a chance got a chance to finally get my hands on KZM and I must say the game has exceeded my expectations. KZM seems to borrow some ideas from previous vita games such as motion aiming from Uncharted, rear touch pad run controls from resistance and bite sized mission as well as multiple paths from Unit 13. The controls were somewhat familiar since I was able to just jump in and start playing without any instruction. There was quite a bit of touchscreen action but most of the actions could be handled simply by pressing a physical button as well. The only exception to this seemed to be the melee kills which required you to mimic a pattern on the screen quickly. To run you either used circle or double tap the back touch-pad, I found myself using the touch-pad the most. Motion aiming was turned off by default so I needed to switch it on and it works while in zoomed aiming. Sniper rifles utilized the rear touch pad to change magnification of the scope by swiping up or down. Now let’s move on to the campaign. I only got to play through the first level which started off with a mission briefing and a short gliding animation. Once in the facility I found my way up stairs to take out my first Helghast. I tried to be as stealthy as a ninja but apparently you have to be crouched to pull off that off which I learned quickly. Looking around I noticed the yellow smiley face icon on the map. This Icon represents the blackjack weapons cache. There are several of these placed throughout the mission as you progress. 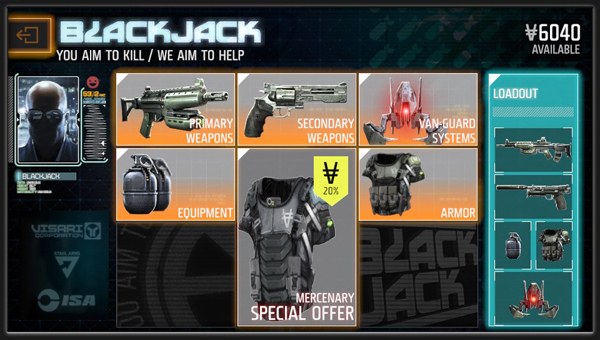 In the weapons cache you can purchase weapons, ammo, equipment, armor and vanguard systems to modify your load out. There also will be special offers that provide discounted gear. When you initially buy weapons or gear its full price after that you need to only pay a set amount to re-equip something you previously bought. The set amount varies on depending which item it is for example weapons you pay 250 where vanguard systems you pay 1000 to re-equip. Starting off you don’t have many options of what gear you can use but as you progress in the game and purchase more you can revisit the levels to play them with different gear. There are plenty of actions that earn you cash even scavenging ammo nets you a small amount. Also as added replay value like I mentioned earlier there are multiple paths to complete every mission so be on the lookout for pipes to climb up or zip lines to ride on. Much later on there was a hacking sort of mini-game which consisted of triangle shapes you try to match the pattern of triangles to hack the device. I fumbled my way through this but was able to figure it out eventually. The mission took about 40 min for me to finish my first time playing it. Having access to more weapons would definitely improve that time but for one single player mission that was a decent amount of play time. Over all it gave me hope that the campaign would be a decent length with added replay value. Campaign isn’t the only part of the game I tried I also spent some time with the multiplayer. The KZM multiplayer I played while at E3 consisted of 4v4 team deathmatch. There were many different people sampling the game and switching out during play so I never got to see a full match but from what I did play I was impressed. 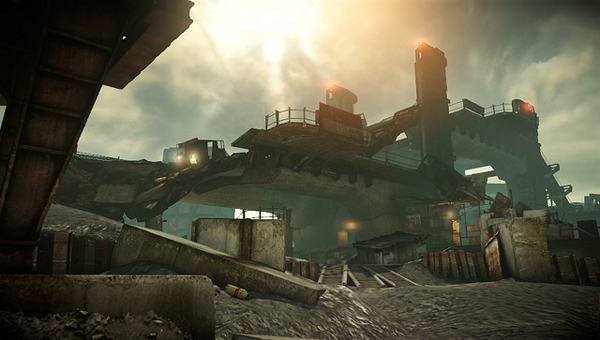 The map I played on I believe was called Shoreline which was a junk yard of sorts and it felt very open. There were ambiance sounds so you never felt like you were playing in a vacuum like some other shooters on the vita. 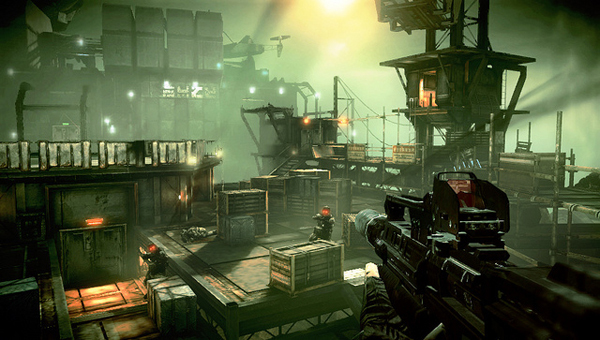 The game had six load-outs to choose from such as assault, heavy weapons, sniper etc. As I was playing I noticed that players I killed were dropping what looked like playing cards. These cards I found are rank related and you get money for picking them up. I imagine the higher rank the card the more money they give. You can also retrieve a team member’s card denying your opponent of the extra cash. This system reminded me of kill confirmed from Modern Warfare 3. Another thing similar to Modern Warfare they had a type of care package which were the equipment pods. Apparently allies above drop Vanguard equipment pods on the map. You activate them by walking up to it and touching the screen or pressing a button. Once activated they grant Vanguard weapon perks such as Porcupine homing missiles, Sky Fury drones, and a flying thing called Manty’s Engine. These perks are something that could seriously turn the tide of a losing streak. Killzone Mercenary was the best shooter experience I have had on the vita to date. Of course the bar wasn’t set very high to begin with but Guerrilla Cambridge really out did themselves. Once this game is released it will have positioned that bar so high that it will be the game people compare all other vita shooters to. Everyone should be looking forward to the Multiplayer beta coming soon hope to see you guys there.